The Organization - Joy Guru, Humanitarian Services, Inc. In August, 2016, Dr. Mitra and his wife Sheema established a foundation named JOYGURU HUMANITARIAN SERVICES. This is a nonprofit charitable organization dedicated to serving the disadvantaged and underprivileged members of our community. JOYGURU HUMANITARIAN SERVICES aims to improve the lives of individuals and families affected by poverty, homelessness, and other social conditions as well as blindness and visual impairment. It promotes the empowerment of women and girls around the world. And it inspires underprivileged children to realize their inner potential and to make a difference in their communities. Ever since childhood, Dr. Satya Mitra has wondered about the significance of his birth. He was born many years after his older brother and sister, and his mother lived only until he was three and a half years old. (See Bio). Difficulties and challenges were all around him, but several people helped him in various ways and he never forgot that. Later, after coming to the USA, Satya Mitra became a disciple of his family priest Sri Sri Mohanananda Maharaj, also known as “GURU”. On his Guru’s instruction, Satya traded a career in science to become tax and financial advisor. Guru also inspired him to use his professional success in his profession to help poor and underprivileged people, something that Satya has always been passionate about doing. 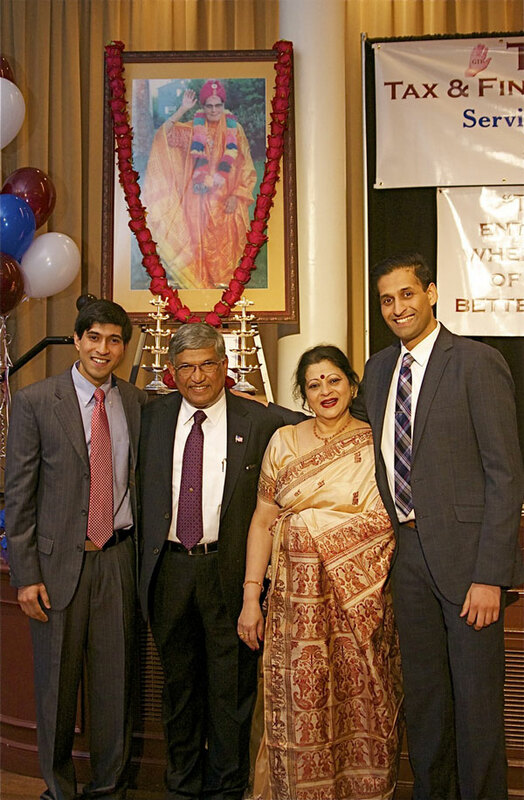 Now that Satya has established a very successful business and has helped his two sons finish their college education, he and his wife Sheema stepped forward to fulfill their own and their Guru’s mission: to help others and provide hope by supporting humanitarian causes. They created the non-profit charitable foundation, “JOYGURU HUMANITARIAN SERVICES,” named in honor of their Guru. The organization is a registered under Internal Revenue Service Code Section 501 (c) (3). Through this foundation Dr. Satya Mitra and his wife Sheema will do their best to give back to the community and help underprivileged people in the local community, across the nation and around the world. Dr. Mitra believes he has ultimately discovered the significance of his being here; to devote the rest of his life to helping others and bringing hope to the hopeless. He says, “We are all born with two packages in our fists, one is the responsibility towards our children and family members and the other is the responsibility to help someone in need”. He is certain that this foundation will give him that opportunity to support various humanitarian services that will better the lives of many and ultimately bring a balance to the world. Through JOY GURU HUMANITARIAN SERVICES he will be able to deliver that second package by being a provider of HELP, a source of HOPE, the ability to HEAL and to touch lives by serving HUMANITY. These four H’s offer true purpose and significance to life! After all, what is life if you live it only for yourself? Read about our founding in this Worcester Telegram article. The programs and initiatives of JOYGURU HUMANITARIAN SERVICES include, but are not limited to, those listed below. Our ultimate goal is to house our blindness, poverty, homelessness, female empowerment and good citizenship initiatives within the JOYGURU HUMANITARIAN CENTER, where deserving people in the community will come to receive services and training. If you wish to contribute to JOYGURU HUMANITARIAN SERVICES’ mission of creating “A Much Stronger, Much Better Community,” or you know of deserving persons or initiatives that could use our assistance in any way, please visit our Support page.